We know we promised a Christmas or New Year's release, but you know how it goes with deadlines. There were more things to fix than there was time needed for it. And so we overshot a little. Please don't kill us. Anyway, today we're officially releasing what we've been referring to as our little 'demo' mod. As you may know our whole ambitious goal proved, well very ambitious indeed, and we decided an in between demo release would be a good idea. Why? Because it gives all of you a taste of what we've done and it may convince many of you to give us a hand in the future development of the mod. There's so much stuff left to do, so many ideas left to explore. So, if you're a modeller, texturer, coder, story-writer or whatever else you think may be of use to us, please consider helping us out! That said, let's get to our demo! 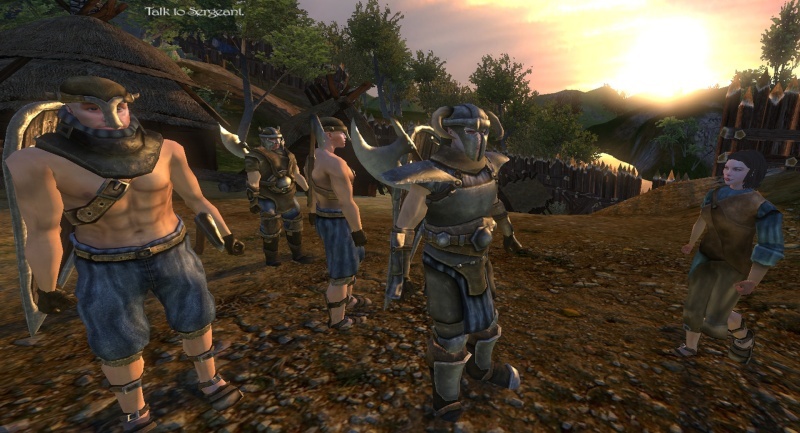 Daydream Demo is built for Warband, version 1.143. It contains as much of our work as we managed to stick in. As a result of that, we've come up with a completely new story and setting that will have no place in the original mod. Some of the characters you'll see will have a completely different role in the actual mod as we want it to be. 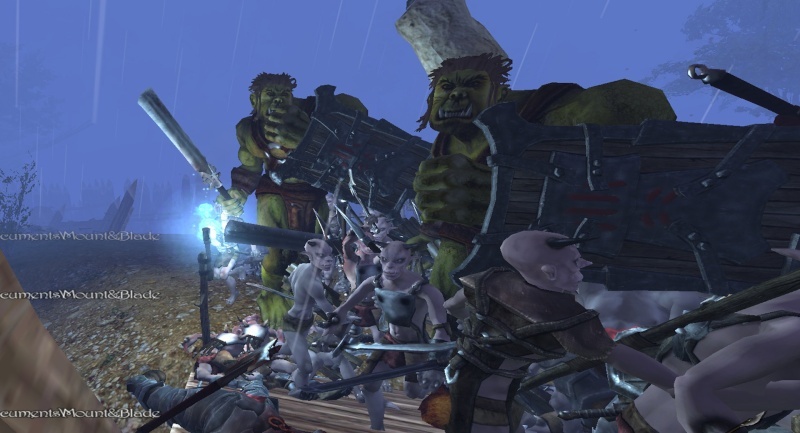 The Elves are one of the two main races in the Land. They are a people with a history of grandeur and sophistication. But, thanks to the constant attacks of the other main faction, the Orgs, who are cruel, scrawny, revolting little bastards, their civilization is in decline. The Elven civilization is scarred by battle: broken stone, quick-fixed defences, scratched equipment, etc. But still they are far superior in military skill and tactics. Their weakness is in numbers, against massive numbers of Orgs. The setting is a small Elven village, somewhere atop a hill. This village is a bit of a backward place, near the front line, yet has been supplying the best Elven Axeman Troops to the Kings Army for centuries. So, in this village you'll be able to play three different battle sequences, which you can access simply by starting a new game. You'll be able to play as a Treasure Hunter just passing through, a Captain of the 5th Axeman Division that is in the village to pick up new recruits and as a Huntress who lives in the village itself. Each character will have its own companions and tasks to complete. Though it will always involve slaughtering massive hordes of Orgs. Don't you worry! For now, that's all you can do and once you complete a battle sequence, you'll be taken back to the main menu. There's no world map or any free roaming you can do. Just these three scripted battles. Don't bother checking out the quick battles either. We haven't worked on that either. Then why do these options still persist in the menu? Because they are hard coded and we couldn't get them out. We're pretty sure you'll encounter more bugs and issues as you play, despite that we've spent quite some time hunting for them. Hell, you might even come across nema, who is still hunting for them... For now we ask that you forgive us these bugs and report them to us so that we may fix them. YOUR TROOPS ARE CAVALRY IN THIS DEMO!!! Installation is as you're used to: just unzip and copy the DDW folder to your M&B Warband 'Modules' folder, next to the one that's called 'Native'. When starting up Warband, make sure you select the DDW mod in the drop down list. wow, it is really nice. in this demo, the storyline is short enough. But it definitely show you guy's ambition! keep going please, i really like this mod. But seriously, really looking forward to any alterations you make in the future, and DEFINATLY the completion of the mod. Very very good artwork and play style. Loved the different heights of enemies and numbers. Worked very smooth and was pretty fun. I definitely loved the mounts as well, I am very interested seeing what others are going to be done. Is this mod dead? I really hope it isn't because it's really intresting and the textures are fantastic!